Confocal immunofluorescent analysis of A549 cells, serum-starved (left) or EGF-treated (#8916, right), using EGF Receptor (D38B1) XP® Rabbit mAb (Alexa Fluor® 647 Conjugate) (blue pseudocolor) and Acetyl-Histone H3 (Lys9) (C5B11) Rabbit mAb (Alexa Fluor® 488 Conjugate) #9683 (green). Flow cytometric analysis of Jurkat cells (blue) and HeLa cells (green) using EGF Receptor (D38B1) XP® Rabbit mAb (Alexa Fluor® 647 Conjugate). 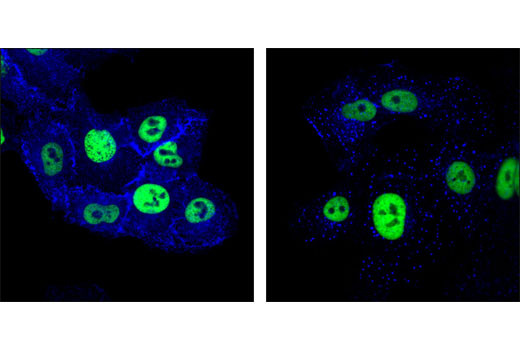 EGF Receptor (D38B1) XP® Rabbit mAb (Alexa Fluor® 647 Conjugate) detects endogenous levels of total EGF receptor protein. The antibody does not cross-react with other proteins of the ErbB family. Monoclonal antibody is produced by immunizing animals with a fusion protein containing the cytoplasmic domain of human EGF receptor. This Cell Signaling Technology antibody is conjugated to Alexa Fluor® 647 fluorescent dye and tested in-house for direct flow cytometry and immunofluorescent analysis in human cells. This antibody is expected to exhibit the same species cross-reactivity as the unconjugated EGF Receptor (D38B1) XP® Rabbit mAb #4267. The manufacture, use, sale and import of this product is within the scope of one or more intellectual property rights (including patents and patent applications) owned or controlled by Cell Signaling Technology. The purchase of this product conveys to the buyer a non-transferrable right to use the purchased product only in research conducted by the buyer. The sale of the product is expressly conditioned on the buyer not using the products or its components (1) to analyze or reverse engineer the product for its chemical/physical properties and composition (including e.g., identification of the sequence); (2) in manufacturing; (3) to provide a service, information, or data to an unaffiliated third party for payment; (4) for therapeutic, diagnostic or prophylactic purposes; (5) resale, whether or not such product are resold for use in research; or for any other commercial purpose. For information on purchasing a license to this product for purposes other than research, contact Cell Signaling Technology, Inc. Business Development at busdev@cellsignal.com.